International shipping is the transport of cargo over oceans by merchant ships from one country to another. It currently makes up approximately 90 per cent of global freight and uses approximately 102,000 merchant ships. Canals are used to greatly improve the efficiency of international shipping by significantly reducing the transit of these merchant ships. Canals are artificial waterways that connect water bodies to allow the conveying of merchant ships inland. They are made up of a series of dams and locks that form reservoirs of low speed flowing water. Large canals, such as the Panama and Suez, significantly reduce international shipping transit by connecting the Atlantic, Indian and Pacific Oceans. When the Suez Canal was became operational world trade flourished, as the time and costs involved in freighting cargo between the Atlantic and Indian Oceans was significantly reduced. A similar boom in trade occurred for American trade when the Panama Canal was completed. Today the Suez Canal conveys 8% percent of international shipping traffic, with 50 ships passing through it daily. The Panama Canal conveys 6 percent of international shipping traffic, with 40 ships passing through it daily. With global freight continuing to grow, proposals are being explored to build larger canals that would add more connections between these oceans or make new connections with other oceans. 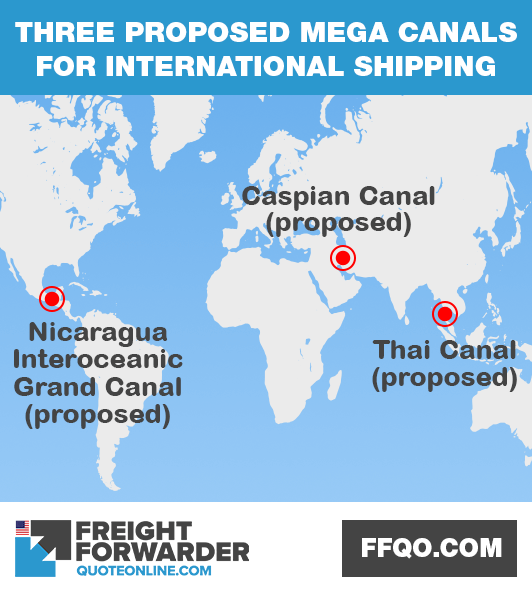 There are three proposed mega canals set to transform international shipping. These are the Nicaragua, Kra Isthmus and Caspian Canals, which will have a major effect on global trade. A Nicaragua Canal was first proposed in the mid-19th century and was to route along the San Juan River to Lake Nicaragua; however, there were concerns regarding what environmental impact the canal would have on Lake Nicaragua – a major fresh water reservoir for Central America. The canal’s viability was also doubted by many international shipping experts and engineers. The proposal was abandoned by the US after it bought the French interests along the Panama Canal in the early 20th century. 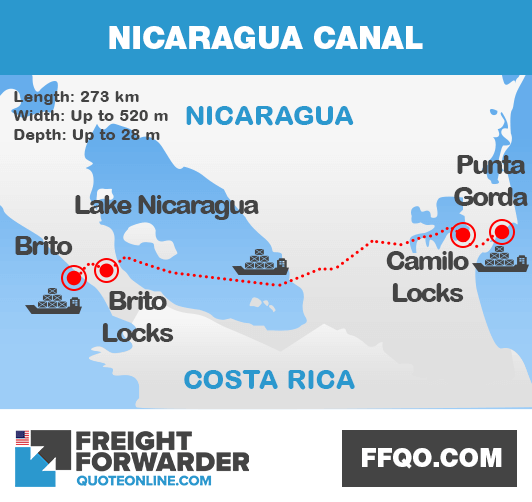 In 2013, the Nicaraguan government granted a 50-year concession to finance and manage the Nicaragua Canal project. It would carve through Central America a channel 273km long, up to 520m wide and up to 28m deep, connecting the Atlantic to the Pacific Ocean. The Nicaragua Interoceanic Grand Canal would allow larger ships to transit between the two oceans and help reduce congestion in the Panama Canal, which was approximately 1,000km to the south. The project was given to the Hong Kong Nicaragua Canal Development Investment Company (HKND) which was headed by Wang Jing. The project was delayed when HKND suffered major financial losses from the Chinese stock market crash of 2015. The Nicaragua government was unable to provide information on how the project would continue to be financed. HKND claimed the project would be financed by debts and equity sales, as well as a possible public offering; however, the group was dissolved in 2017 and the Nicaraguan government stated that it would persist with the project in 2018. The Kra Isthmus Canal was proposed in 2015, to connect the Gulf of Thailand with the Andaman Sea. The canal would bypass the Straits of Malacca by carving a 50km channel through a finger of land in the south of Thailand called the Kra Isthmus. It would be 102km long, up to 400m wide and up to 25m deep. International shipping transiting from China and Japan to India, the Middle East, Africa and Europe would benefit immensely from this canal, shortening the route by 1,200km. 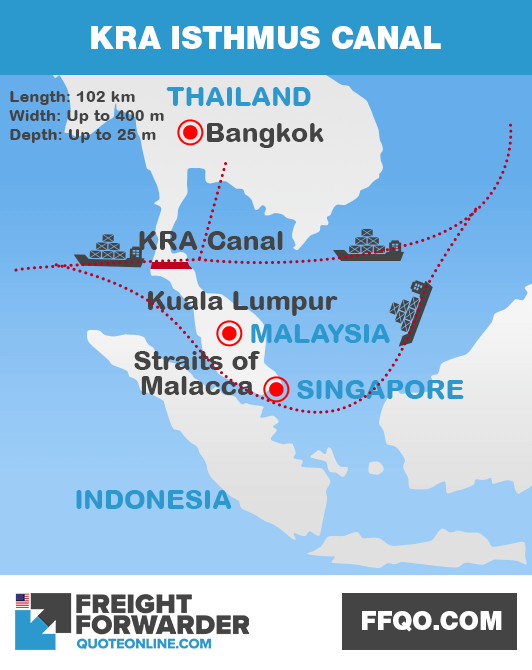 One-third of Chinese international shipping currently passes through the Straits of Malacca. The 8,500km route for container ships transiting between Shanghai and Mumbai of would be shortened by 20per cent.. The 13,330km route for oil tankers transiting from the Saudi Arabia to Japan would be shortened by 9 per cent. Environmental impact challenges and the high cost of US$28 billion have delayed the project. In 2018 the prime minister of Thailand, Prayut Chan-o-cha, said the canal was not a government priority but imagined that construction would commence soon. The Caspian Sea is the world’s largest inland body of water that has no outflows. It shares its coastline with Kazakhstan to the northeast, Russia to the northwest, Azerbaijan to the west, Iran to the south and Turkmenistan to the southeast. It is likely that the Iranian government would sideline any major environmental impact concerns that would arise from the project. It would double up the use of the waterway as an irrigation canal, which would transform its dry and mostly unusable countryside. 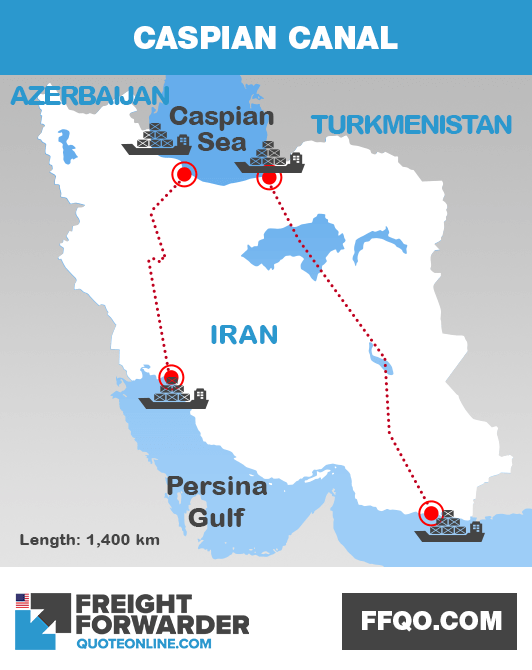 Iran is waiting on Russia to commit to the project in order to proceed. There are only a few small disadvantages in relation to canals. They are traffic choke points vulnerable to disruption by any number of causes including accidents, natural disasters and occupation. This is assuming the environmental impact is properly managed. However, the benefit to global freight by significantly reducing international shipping transits is far greater. They allow countries with varying levels of resources and manufacturing to trade more efficiently. Mega canals amplify this effect and greatly expand business opportunities that could not have been previously feasible. With over 40,000 locations in our global freight network worldwide and a full range of international shipping services, we are confident we can give you the help we need. We provide full-costing upfront international shipping with no hidden costs. With our low overheads, we are able to give you the best prices. If you are looking for fast, lean, transparent international shipping then contact us online and send a message. You can even message us on Facebook for help on international shipping. This entry was posted in News on November 30, 2018 by messengerdev.